Lots of people suggest rounding the cylinder corners, or radiusing the edges of the cylinder. Why do they suggest this, what good does it do? Well, to find out, let's start off with a little SCIENCE!!! 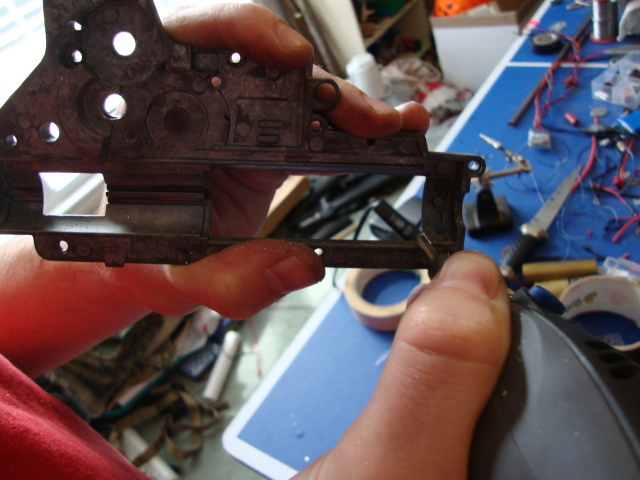 Here you can see a model of the gearbox shell and how it's shaped around the cylinder. The darker red the color, the more pressure and force that's on the metal. You can see on the left picture, how the cylinder edges aren't radiused, there's lots of orange, and even a little red. The red means that it's a breaking point. Now, when you look at the right picture, you see that the cylinder's edges have been radiused, and everything is a much nicer color, less stress, and less likely to break. The corners there, on a stock gearbox, are pressure points. All that pressure slams into the front, and those points take a lot of it. By rounding them out, you are making those "points" larger, so all that pressure is spread over a larger area. This is similar to why AoE is good. Larger contact pressure, less likely to break. Now, obviously, there is a limit to how large they need to be, you don't want paper thin walls. So, that's where I'll help out a little more, MORE PICTURES!!! This picture here, is a stock Classic Army M16 X-Series gearbox shell. Just like any other version 2 gearbox shell you'll find in a stock gun. Note how the edges of the cylinder hole are not rounded, they're corners, corners are bad. 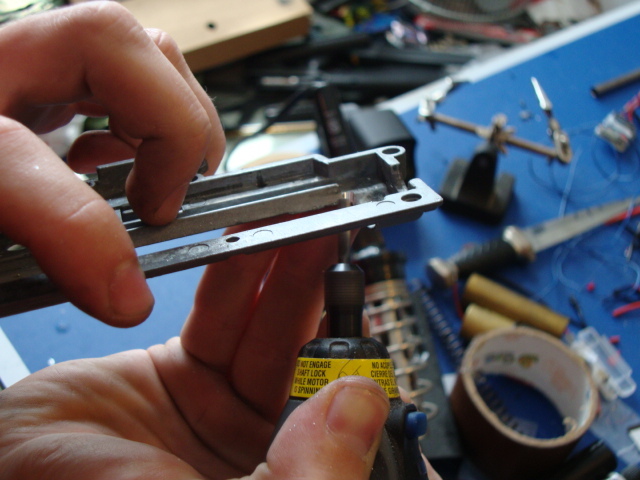 I use this dremel tool to remove material from the gearbox shells. 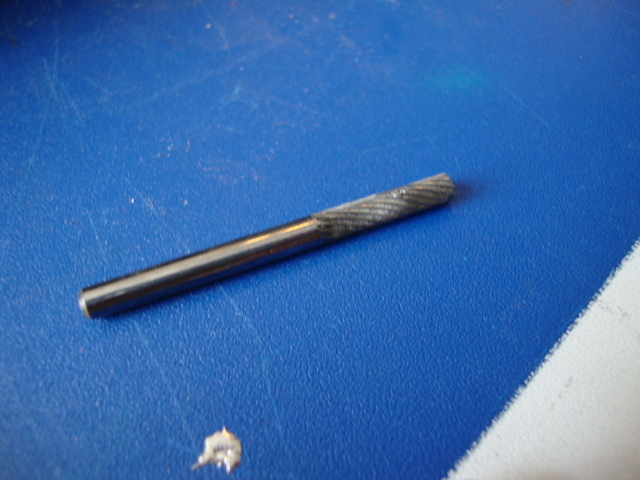 I believe it's a steel cutting Tungsten Carbide Cutter, piece 9901 for those of you with a dremel. For those of you without, a rat tail file will work, it just takes a lot longer. You basically, only want to remove enough material, to get rid of the corners that are there. Once they are 100% gone, then stop, you don't need to take any more away from the gearbox. Anything extra will only lead to problems. You have a properly radiused cylinder. A few notes before I wrap this up. Be sure to remove the metal shavings from the gearbox, you don't want that getting around, it'll cause problems. 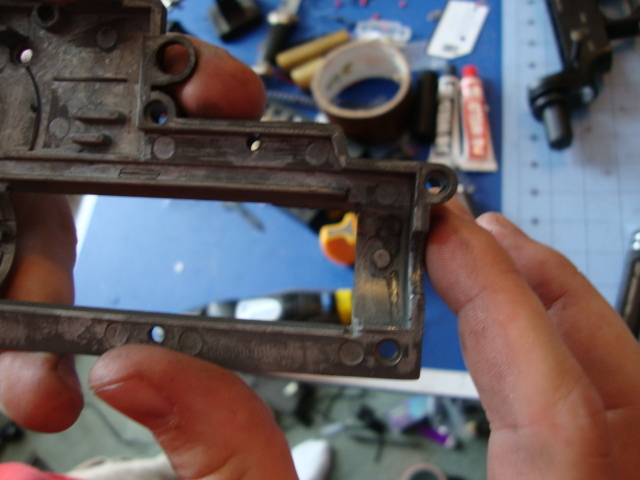 It's better to try and remove more material from the front of the gearbox than from the sides. 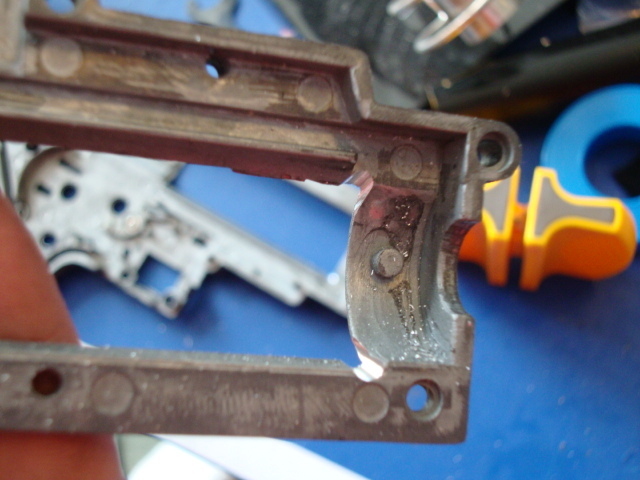 You do really want to leave as much material as possible on the bottom and tops of the gearbox. Remember to always use eye protection, metal shards + eyes, no fun there either. I also find that sometimes gloves, or doing this in an easy to clean up area is a good idea as well. Metal shards can act as splinters, and those won't decay like wooden ones will. Be careful. Take your time and take it slowly. If you ever have any troubles, questions, or decide that you don't feel comfortable doing this yourself and want someone to do it for you, feel free to Contact Us.